The other day, my dad and I watched a Western that I had never seen before. Seven Men From Now starred Randolph Scott as the hero and Lee Marvin as one of the various villains. After watching the film, I read that John Wayne produced the film and planned on starring in it. However, John Ford wanted him to be in The Searchers. As it turns out, this was a good move for everyone. John Wayne played one of films most iconic characters in a movie that many feel is the greatest Western ever made. Randolph Scott credited Seven Men From Now as the movie that revitalized his career. That is a lot of information to throw out without writing about what is really on my mind. 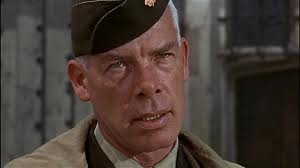 Lee Marvin was great in the movie and watching it brought to mind the other great films he was in. That means that we are now going to explore the movies of Lee Marvin to see what words of wisdom we can glean from them. Ninety-nine percent of everything we do is strict routine. Only one percent requires creative intelligence. I believe a man is as big as what he’s seeking. Somebody’s always looking for something in this part of the West. To the historian it’s the Old West, to the book writer it’s the Wild West, to the businessman it’s the Undeveloped West. It’s gonna take an awful lot of whiskey to wash out your guts. A man oughta be able to take care of his woman. Greatness? Ha! If that great philosopher, Socrates, were living today, he’d be reduced to sitting on a cracker barrel, chewing tobacco. That’s what America does for greatness. War is the most monstrous of man’s illusions. Any idea worth anything is worth not fighting for. The home-grown tomatoes are always best. I got one rule: never go to bed without makin’ a profit. Courage can be purchased at yon’ tavern! As for you, Old Man: go West and grow young with the country! I never went in for embroidery, just results. Surviving is the only glory in war. Well, I just figure any man who risks his neck to save a dog’s life isn’t going to kill someone for gold teeth. All of that and more can be learned by watching more Lee Marvin movies.